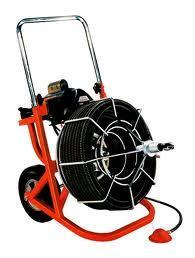 Used for cleaning the 4" main line from the house to the street. Foot Pedal: Leaves operator s hands free to control cable. Uses air pressure, so there's no electrical contact between pedal and motor. Cables: 5/8" for 3-6" lines. Cutter Set: Spear Head, 2" U-Cutter, 3" Heavy-Duty Side Cutter, 3" Heavy-Duty Saw Blade and Large Retriever. * Please call us with any questions you may hav about our snake sewer 100 foot elec rentals in Wayzata MN and the Western suburbs of Minneapolis.